D-Link has a wide range of wireless products created for business and personal or home usage. The DAP-2553 is a good example of a perfect cross over between business and personal use wireless solution. It has the best in class technology with enhanced range and throughput designed to deliver a complete wireless solution regardless of where and how it is deployed. Wireless Specification: The DAP-2553 wireless access point is a dual band solution that can operate at 2.4GHz as well as 5GHz. At the 2.4GHz range, the device supports 802.11 b/g/n standards while at the 5GHz range it supports 802.11 a/n standards. With the backward compatibility, this access point allows multiple devices new and old can successfully connect to the wireless network. On the 802.11g the access point can support 54Mbps, 802.11b it can support 11Mbps and 802.11a it can support 54Mbps. While it supports amazing wireless speeds with the older standards, the 802.11n boosts this rate up to 300Mbps. This high speed network can support voice, video and high end gaming applications thus future proofing the network. Wireless Security: The DAP-2553 supports state of the art wireless security encryption standards in WPA or Wi-Fi Protected Access. This device supports WPA in two different versions – the enterprise one suited for networks with dedicated security architecture and the personal one that is used in homes without a security or authentication server. WPA-Personal is very similar to the WEP or Wired Equivalent Privacy wherein a pre-shared key is used to secure the wireless network. With the WPA-Enterprise flavor, the device is compatible with an AAA server like the RADUIS server which handles all the authentication requests. The device also supports Multi-SSID to segregate various connected devices into different set of users that cannot talk to each other. Along the same lines the device also supports multiple VLANs. It can also classify access points in the network as Valid, Neighbor, new or Rogue and filter them out accordingly. Wireless Operating Modes: This is a very interesting feature with the DAP-2553 access point. It can operate in four different modes: Access Point, WDS (Wireless Distribution System), WDS with Access Point and Wireless client. WDS: In this mode, the access point becomes a part of a much larger wireless network with other access points. It can communicate with the access points to provide a seamless wide area wireless network. It would work as a bridge between access points and wired LAN segments but not provide wireless connectivity to individual devices. WDS with AP: In this mode it acts as a WDS bridge as well as a hub like access point providing bridge connectivity as well as wireless client connectivity. 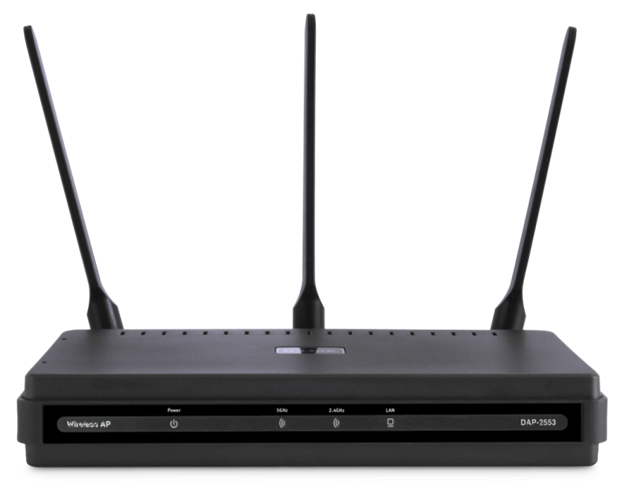 Wireless Client: In this mode the DAP-2553 acts as a wireless adapter for Ethernet based devices. Basically, it is like a wireless dongle for Ethernet devices. Ethernet Connectivity: The device has a couple other interesting features on the Ethernet interface. DAP-2553 supports 802.3af or Power over Ethernet solution that allows it to draw power from the CAT5 or the Ethernet cable without having to connect a separate power cable. While this feature may not mean much in domestic setup, in the enterprise settings, this implies a lot less cabling which makes the network design very straight forward and the deployment less expensive. The Ethernet port can support 10/100/1000 Mbps; thus it can connect to Ethernet devices, Fast Ethernet devices as well as Gigabit Ethernet devices. Since the device has a single port, this versatility in connectivity is quite important in enterprises. Accessing the Configuration Menu: The DAP-2553 access point comes with a factory default setting where the DHCP client is disabled and the IP address is set to 192.168.0.50. The configuration of this device can be accessed through the web browser when it is connected directly to a computer. For the computer to access the access point, it needs to be in the same subnet as the device. To ensure this, the user or administrator needs to assign a static IP address to the computer that is in the same subnet. This means that the computer must have an IP address like 192.168.0.x, where x can be any number between 0 and 255 but not 50. Following the steps mentioned below, the configuration menu for DAP-2553 can be accessed. The DAP-2553 configuration wizard is displayed.